...it was more a sense that this moment on this particular morning was meant for peaceful reflection, not toil. Miss Kitty had already settled in her chosen sunny spot on the floor and so while she semi-snoozed, my own thoughts meandered along like a river, no thoughts of guilt that I should be doing something else. It felt like heaven. It was just a few minutes but I felt peace settle about my shoulders. And I felt a shift in my soul... a sense of things coming into balance. Ahhhhhhh. I didn't realize that my soul feathers had been so ruffled from the busyness of the past few weeks. But in a twinkling all felt well again. I'm reminded of a phrase from an old hymn... when peace like a river attendeth my soul..... that's what happened this morning. 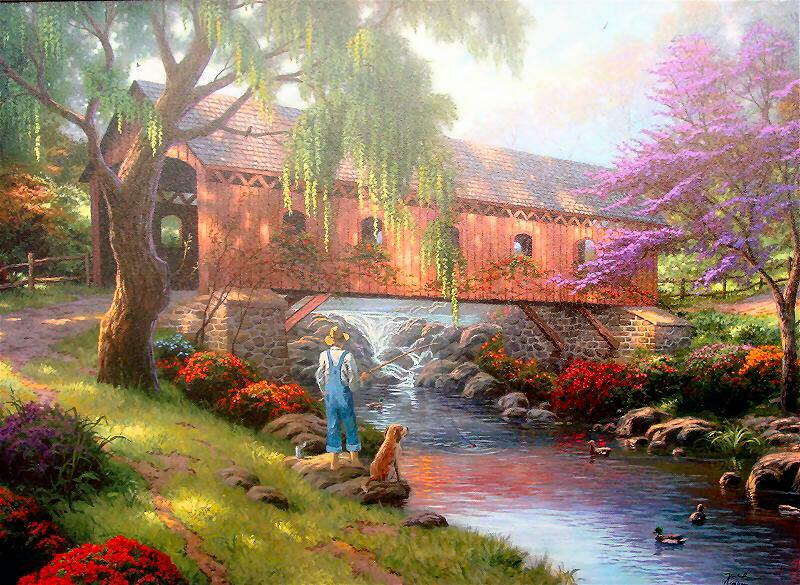 You think that fellow in the picture with his dog fishing along the river feels that peace too? I'm ready for the day...... ready to pick up the chores and vacuum hose.......... they don't seem burdensome now.... for it is well. My soul is well. I am well. Wishing you moments of peaceful 'heaven on earth'. we each need to do that daily...meditation, prayer or scriptures can bring that peace to us. "I didn't realize that my soul feathers had been so ruffled from the busyness of the past few weeks. But in a twinkling all felt well again." Love this description. I wonder why God must MAKE us rest? Glad you listened to His voice today. Beautiful post! I know the feeling of ruffled soul feathers . . . and the settling down of the same in the quiet and stillness of a morning. Your words paint a beautiful word picture of stillness before Him! One of my very beloved songs and it always brings peace to my heart when I hear it. It has been enjoyable for me to visit your blog again. I enjoyed reading each post that I had missed. I think grilled salmon sounds so delicious to me. You are fortunate to have your nephew grill for you.